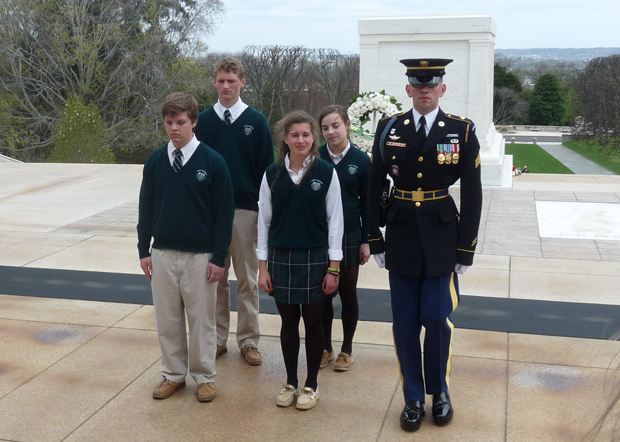 Four student representatives of 43 history students of Bishop Shanahan High School participate in a wreath laying ceremony March 31 at Arlington National Cemetery. 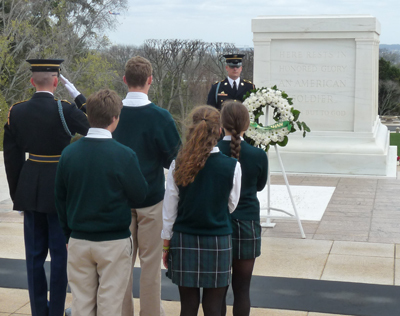 Students of Bishop Shanahan High School participated in a wreath laying ceremony March 31 at the Tomb of the Unknown Soldier at Arlington National Cemetery. For the eighth time Shanahan teacher Roger Arthur led students of his Honors U.S. History Themes classes from the archdiocesan high school in Downingtown to Arlington, Va., for the solemn ceremony, which he arranged with the cemetery and for which Bishop Shanahan provided the wreath. Selected by the 43 students on the trip to represent them in the ceremony were Lauren Ciarrocchi, John Kozinski, Margaret Boncek, and Patrick Nulty. Following the Changing of the Guard Ceremony at the tomb, the Relief Commander of the 3rd U.S. Infantry Regiment (the Old Guard) accompanied the four students down a staircase toward the Tomb of the Unknown Soldier where they were met by a wreath bearer who had ceremoniously carried the Bishop Shanahan wreath to the site. The students moved forward to accept the wreath and the wreath bearer then assisted Ciarrocchi and Kozinski in placing the wreath on a stand before the tomb. A bugler sounded “Taps” before all four students were escorted back to their places. In addition to the Tomb of the Unknown Soldier, the students also visited John F. Kennedy’s gravesite, the Challenger and Columbia Shuttle Memorials, the Delta Force Memorial, First Lt. Audie Murphy’s and Sgt. John Basilone’s gravesites, the Custis-Lee Mansion, the Confederate Memorial, the Pentagon Memorial and the Marine Corps War Memorial (Iwo Jima Memorial). Several students were able to locate and visit their relatives’ gravesites while at Arlington National Cemetery.